Inspired by Dave Addey's post on using font's in your iOS app - and having a general love of the Google Web Font library - I thought "so, how do I do this in MonoTouch?" Turn out, using a custom font in MonoTouch is really, really easy. First, go and grab a font or 2 from somewhere. I used the Google Web Fonts, which are free to use, but you DO have to show their license in your app. Not a big deal. 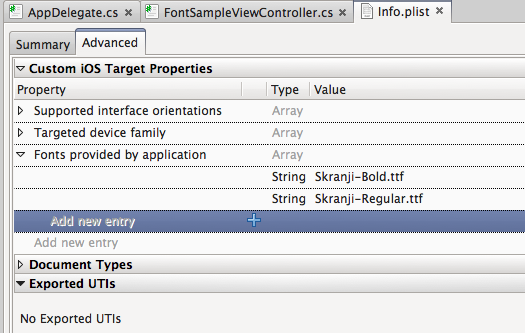 Open info.plist, and under advanced, add a new key called Fonts provided by application. This is an array. Make a new array element for each one of the font's you use. I suspect if you put them into folders, you need to put in fonts/MyFont.ttf there. Turns out it's trivial to use any of the lovely fonts that are available. Just be a bit careful with licensing, and above all, make sure your app looks great - too many random fonts just make a mess. And don't use Comic Sans, unless you are writing a comic app. That'd just be wrong.